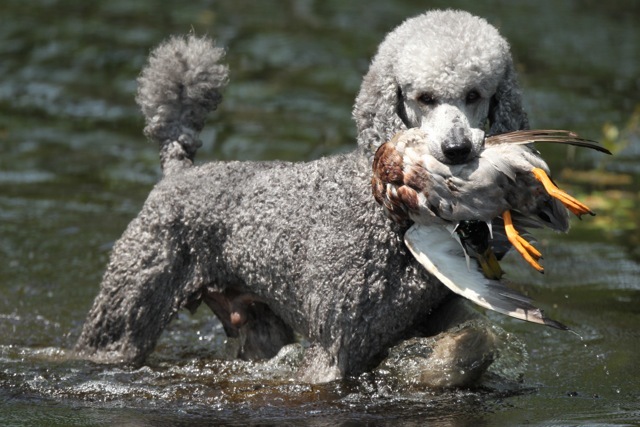 Editor’s note: The Poodle was originally developed in Germany as a water retriever, and the Standard is the original size, used to locate game and retrieve shot birds on land and water. 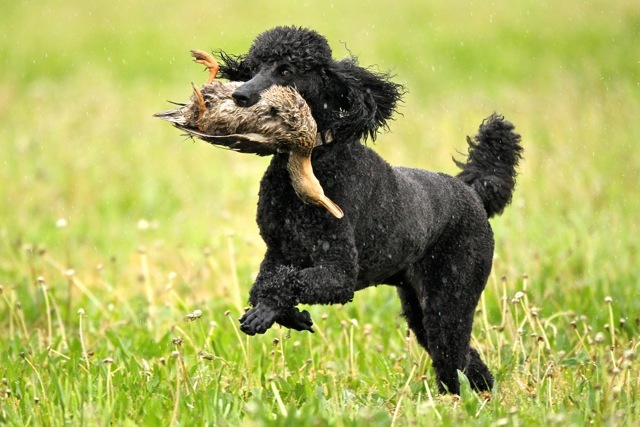 Like other hunting breeds, many Poodles retain the hunting instinct, and owners can test their dogs’ instincts and abilities at hunt tests. The hunt test is designed to replicate a real hunting situation. Gunners out in the field shoot the birds or fresh dead birds are placed in the field, and the dogs are sent to retrieve them. Dogs are judged in three divisions, Junior, Senior and Master Each division, of course, requires more from the dog than the one before. 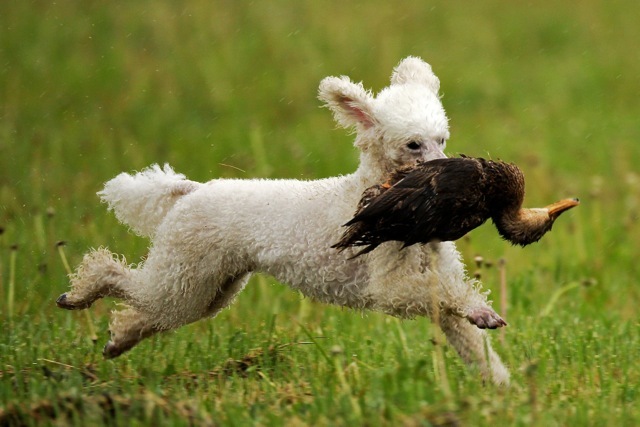 The hunt test does not judge each dog against other dogs, but instead against a standard, and each dog is scored according to its performance. 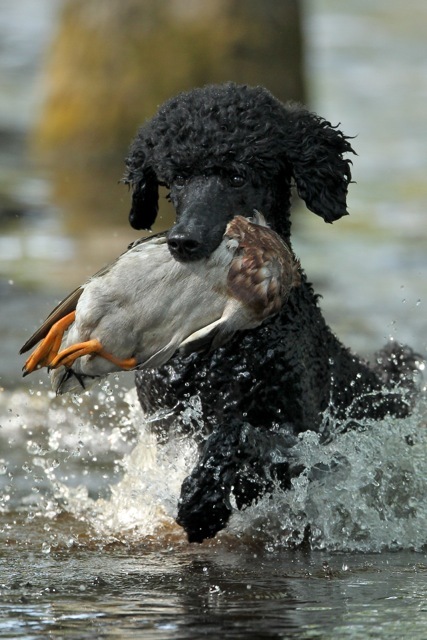 To achieve hunt titles, dogs are required to perform progressively more difficult tasks, from marked retrieves, where the dog sees the bird fall, to blind retrieves, where he does not. Dogs are trained to respond to a whistle and, in the Senior and Master divisions, are required to work off of their owners’ hand signals. All tests require increasing levels for both “natural attributes” and “acquired attributes,” including “style,” courage, perseverance, steadiness, response, trainability and other indications of a proficient hunting dog. 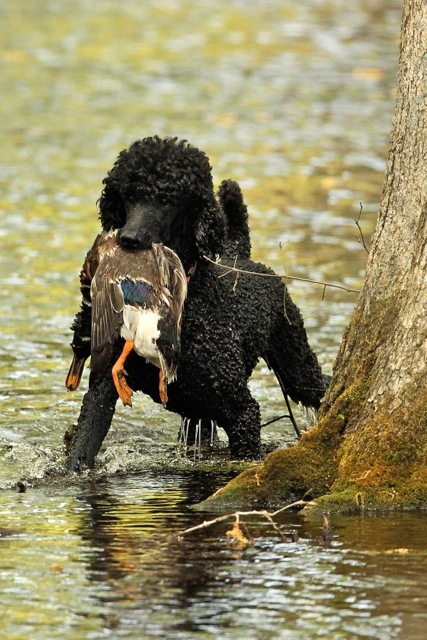 Achieving a Master Hunter title requires much more training and mastery on the part of dog and owner. 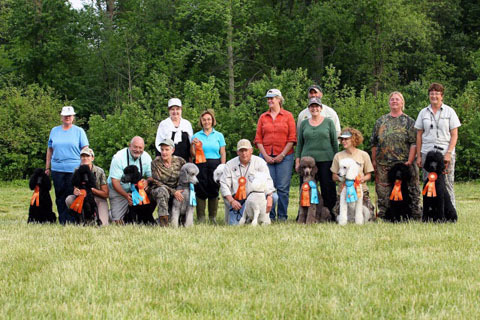 Poodle Club of America’s show week is arguably “The Greatest Show on Earth,” but not many people realize that it all starts with a long weekend of outdoor events including tracking, hunt tests and working certificate/excellent tests. Poodles are an amazingly versatile breed and our working dogs showcase their talents in these venues. Friday began with Tracking Dog and Tracking Dog Excellent tests, held at Anatidae Farm in Rhodesdale, Md., also the site of the Hunt Test and WC/X tests on the following two days. The weather was warm and sunny for the tracking tests, and watching the Poodles’ tails just over the top of the tall hay was a sight to behold. Brown Standard Poodle Ch. Carlyn Song of the South CDX TDI WCX, owned by Suzanne Fairbairn. Black Standard Ch. Carlyn's Charismatic WC, owned by Joyce Carelli and Michael Lamb. This year the tests drew more than the allowed six TD and three TDX tracks, so contestants were selected using a random draw. 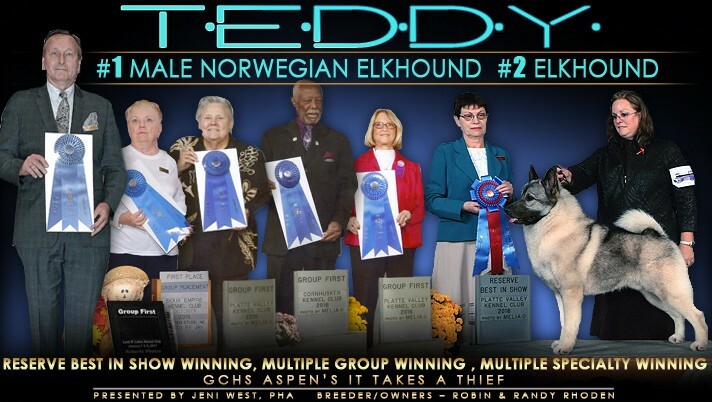 At least two competitors who had already earned their titles volunteered to give up their tracks to those that were not titled, showing that Poodle folks are also some of the nicest in the world of dogs! Three of six passed TD, and one passed TDX. Silver Standard Ch. Lemerle Silk Tie JH WCX, owned by Lin Gelbmann. Saturday’s hunt test included an entry of 11 in Junior Hunter, five in Senior Hunter and three in Master Hunter. Weather was again warm and nice, but looking at the forecast for Sunday, it was apparent that we were in for a day of cold rain. Judges Ron Reed and Judy Gladson efficiently worked all the hunt test dogs through their tests by about 3 p.m., and a decision was made to beat the weather and run the WCX on Saturday afternoon-evening. The test had five Junior Hunter passes, Senior Hunter had three passes, and all three dogs that ran in Master Hunter passed. Congrats to all those that earned legs on titles and some that earned their titles at this test. Black Standard Poodle, The Divine Miss "C" WC, owned by Margaret Fox is a rescue dog! 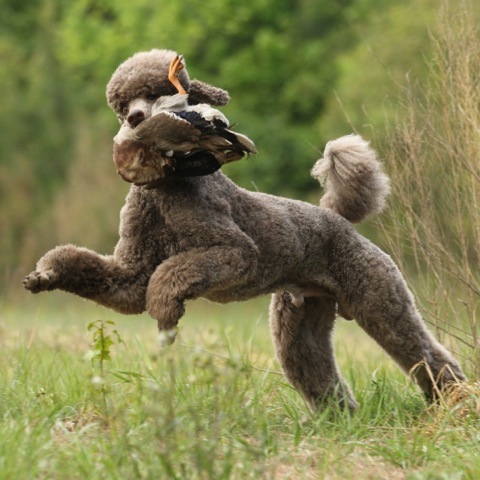 One Poodle qualified for the Master National Retriever Test by passing this test at the National. The white Standard, Bibelot’s Tolka Hands Up, is owned by Mia DeBenedetto and Jack Combs, and handled by Jack. Next, the WCX setups were done efficiently, running water first as that was where we finished up in the MH tests. Then on to land where a total of eight of 12 dogs earned passes at the WCX level. Black Standard Tudorose McCheers SH NA NAJ WCX, owned by Mary Ruth Calhoun. White Miniature Poodle Palman's Heart of Rockn Roll, owned by Roslyn Beaman and Elizabeth Pateman. Sunday’s weather forecast was unfortunately correct, with cold and rainy conditions all day. Twenty-one Poodles (four Miniatures, 17 Standards) were entered in WC, and all braved the cold and rain to compete for their WC titles. 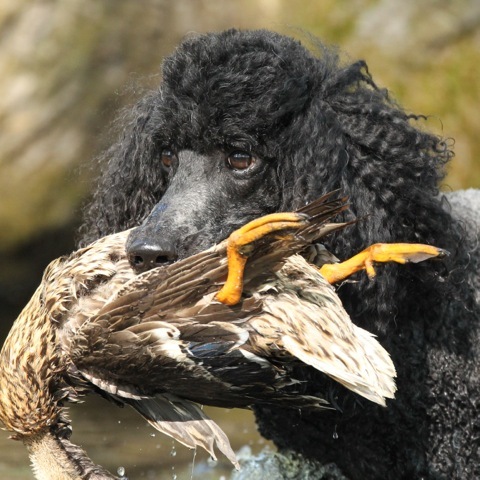 Sixteen of 21 dogs passed, including one Miniature Poodle whose duck was almost as big as he was! While the land tests were pretty straightforward for all the hunt events, the water portion of the tests was held in a flooded timber pond, something that I know most of the Poodles had never seen before. Mature trees provided plenty of obstacles for the dogs, while hiding the ducks in and among the trees was really easy. Finding open water for the tests for the less experienced dogs was the challenge here! Silver Miniature MACH Menina de Prata RA OF, owned by Beth White. Black Standard Tudorose Dreamcatcher Daventry CDX ThD WC, owned by Jean Bedenbaugh. With the successful completion of the field events, most of the Poodles moved inside to the Wicomico Civic Center to continue competing in agility, obedience and rally on Monday and Tuesday, with many qualifying and earning more titles. 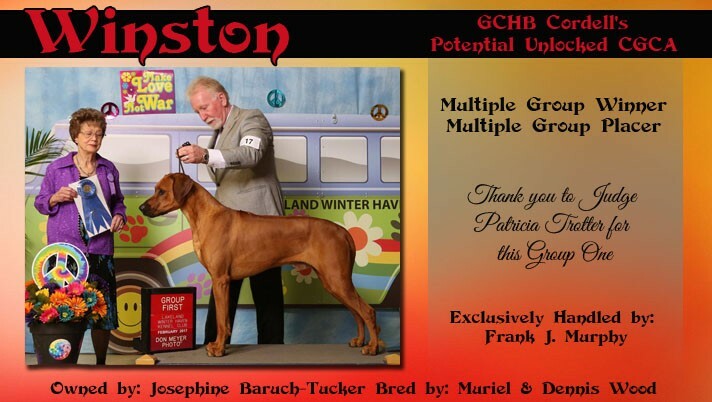 PCA then continued with three days of conformation judging – truly The Greatest Show on Earth! White Miniature Vanir's Palman's Beau Jest WC, owned by Roslyn Beaman. Most, but not all, of the qualifiers from the Saturday Test, from left to right: Helene Huffer with Carrington's Lady Isabelle; Carol Stone with Unicorn's Rare and Radiant Maiden "Nevermore" JH RN; Dale MacKenzie with Tudorose Preacher HEB 12:1; Lin Gelbmann with Ch. Lemerle Silk Tie JH; behind Lin is Mrs. MacKenzie; Mia DeBenedetto and Bibelot's Tolka Hands Up MH THD; Jack Combs and Lonetree's Go Bang MH; judges Judy Gladson and Ron Reed (in back); Suzanne Fairbairn and Ch. 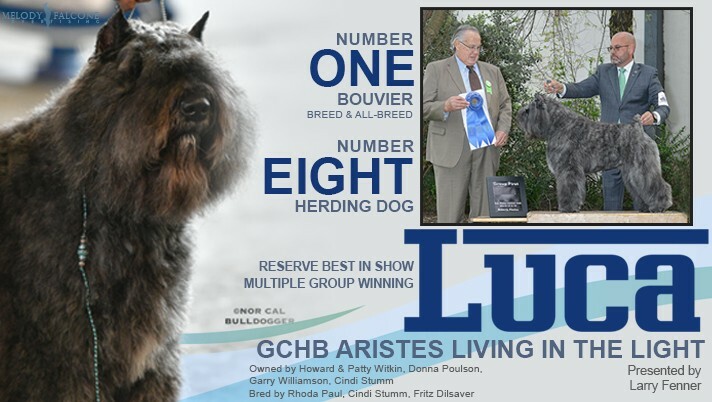 Carlyn's Song of the South CDX TDI; Libbe Erickson and Swags Runs Smooth as Silk UD JH RN; Jan Winner and Akelter's In Lieu Of; and Joyce Carelli and Ch. Carlyn Hard Spun JH. Thanks, Joyce and John, for the interesting article and the amazing photos. 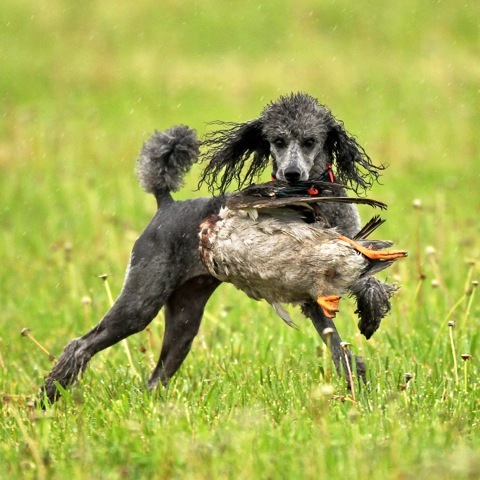 Poodles can do anything, and they do it with GREAT HAIR! Great article and awesome pictures!!!! 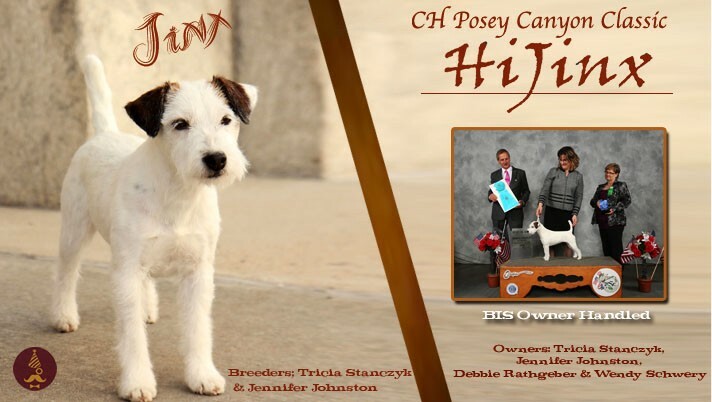 These would be awesome pictures and/or video for the Westminster broadcast – so people could see what the “fanciest of the fancy dogs” can really do!” They would be shocked!! Absolutely beautiful photos of beautiful dogs! The minis are especially amazing! I think Poodle people the world over can be proud of what our breed can do, and we owe many thanks to Joyce and John Carelli — Joyce for writing this article for us, and to John for his absolutely remarkable photography. Loved this article! I showed (well, actually, my dog did! LOL!) 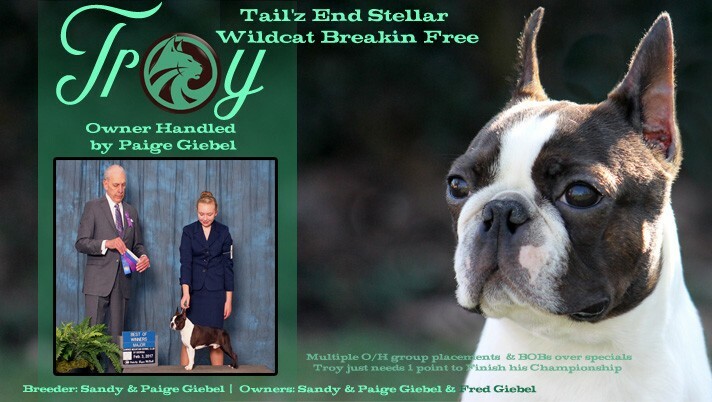 at PCA in breed, rally and earned her CGC. It was a delightfull event and I was disappointed that it rained so hard on Sunday, as I had planned to bring her so we could see if she has the interest/drive for hunting. Somehow, geting a puppy in full show coat too wet would not have won me any friends when we would have gotten to PCA since I would not have had a place to dry her. Oh well….hopefully next year! In the meantime, off to trying luring and doing more events until her adult coat is ready for breed. 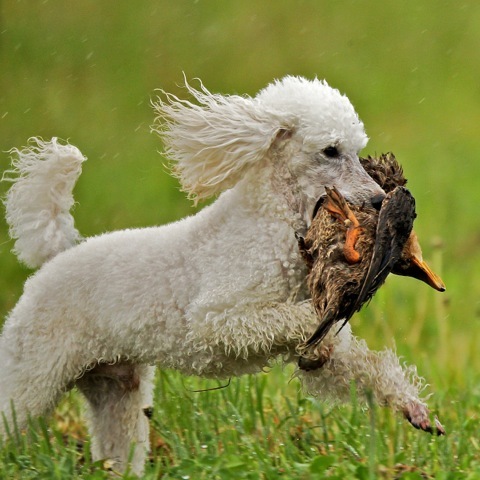 I love our “can do it all…and do it well” Poodles! Wonderful article. I greatly enjoyed it.